OTTAWA, September 15, 2016 - The public is invited to a free public lecture on Monday, September 19, from 6 p.m. to 8 p.m. presented by the winners of the 2016 Governor General’s Medals in Architecture. The award-winning architects will share the stories of the 12 winning projects, from conception to execution, with lively five-minute presentations, complete with images and a question and answer period. The projects represent many types of buildings, from a library that evokes a pile of books to one of the world’s tallest timber structures, a factory, hospital, temple, aquatic centre, head office, amphitheatre, observation platform, public square, and more. They also span from coast to coast, from Vancouver to Halifax. The architects will receive their awards the next day, on September 20, at a ceremony at Rideau Hall. The Governor General’s Medals in Architecture are awarded every two years. This is the second time that the Royal Architectural Institute of Canada (RAIC) and Canada Council for the Arts have presented 12 Architects on Architecture for public enjoyment. The Governor General’s Medals in Architecture recognize outstanding achievement in recently built projects by Canadian architects. The program, created by the RAIC and jointly administered by the Canada Council for the Arts, aims to develop the discipline and practice of architecture, and increase public awareness of architecture as a vital cultural force in Canadian society. 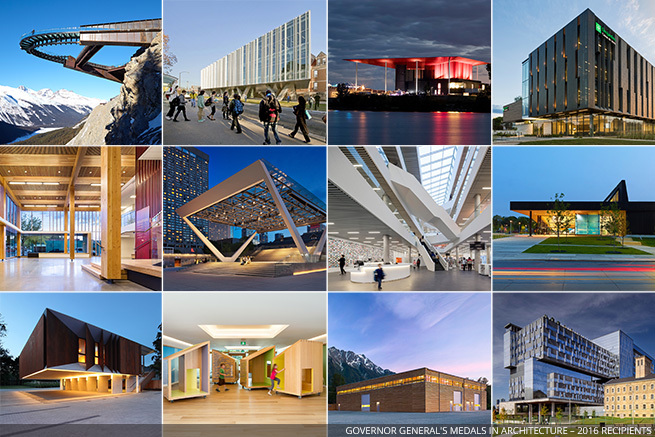 A full list of the 2016 Governor General’s Medals in Architecture can be found on the Royal Architectural Institute of Canada’s (RAIC) website at www.raic.org. This year marks the first time a landscape architect has been awarded a Governor General’s Medal. Cornelia Hahn Oberlander, Hon. MRAIC, is the inaugural recipient of this lifetime achievement award. She will be in attendance to speak about her career as a leader in the profession of landscape architecture. The lecture is presented by the RAIC in partnership with the Carleton University Forum Lecture Series, the Canada Council for the Arts, and the Ottawa Regional Society of Architects. The Canada Council for the Arts is Canada’s national public arts funder. They champion and invest in artistic excellence so that Canadians may enjoy and participate in a rich cultural life. In 2014-15 the Canada Council allocated $155.1M towards artistic creation and innovation through our grants, prizes and payments. They also conduct research, convene activities and work with partners to advance the sector and help embed the arts more deeply in communities across the country.